It's hard for me to overstate the impact Petra has had on my life. I didn't grow up in the Church, so my musical tastes in high school ran a little on the “rough” side. When God's grace was revealed to me in high school, the very first Christian record (that's right, record; as in lp; as in vinyl back in the day before it was “retro”), was Petra's “More Power To Ya.” Thinking that I was going to have to switch from AC/DC, Van Halen, Journey, etc. to only listening to Sandi Patty, Petra was a welcome revelation to me. My first Christian concert was 1983's “Not of This World” tour. Petra was the soundtrack to my late teen years, and one of the big motivations for me to get into Christian radio. One of my favorite memories was doing a New Year's Eve gig with Greg X. Volz as he was first embarking on a solo career. My youngest son's name is Kenaniah. We tell everyone it's because of David's song leader in 1 Chronicles 15, which is true. But I have to admit that the song from “This Means War” heavily influenced my love of that name. 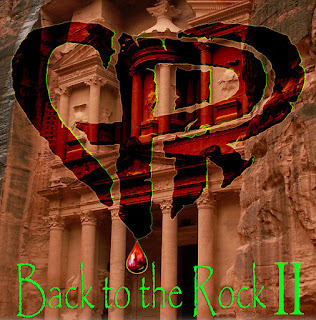 I say “sort of follow up” because while the first Back to the Rock featured the 80s lineup of the band, this version is a mixture of Petra personnel from over the years. The most notable differences are the absence of Bob Hartman on guitars (can it really be Petra without Bob?! ), and Ronnie Cates on bass, who was never with the Greg Volz version of the band. Longtime Volz collaborator Kirk Henderson takes up the guitar work. But those technicalities aside, this is a fine addition to the classic Petra catalog. The track listing includes updated arrangements of slower favorites like “Hollow Eyes,” “The Coloring Song”, and “Not of This World;” as well as classic rockers like “Judas Kiss,” “Beat the System,” and “It is Finished.” Most of these arrangements are quite similar to the originals, with producer John Lawry's keyboards having a heavy influence in these newer renditions. The real question for me was if Mr. Volz' “pipes” were still up to the challenge. Years ago on a solo project, he did a cover of Aerosmith's “Dream On,” which I loved as much as the original. The CPR version is almost as good, making me think the range was still there. However, I admit to being slightly disappointed with “All Over Me” and “Praise Ye the Lord.” The originals showcased soaring vocals from Volz, while these newer versions lack those memorable moments. Still, in spite of age maybe finally catching up a bit, this is a fun project. And it's well worth the investment for any true Petra fan. Over the years, Petra has endured as one of my favorite bands. I've even passed the fandom on to our kids, who went with us to the “Farewell Tour” a few years back. And Kenaniah himself gives “Back to the Rock II” a big thumbs up.